Recently, I was asked a question about when a person should be started on blood pressure medication. This made me think about how the treatment recommendations have changed over time, several times in fact since I was in medical school. The latest guidelines for treating blood pressure were published in November 2017. I thought you might be interested in hearing about these new guidelines. It is important to first realize that in the United States, high blood pressure accounts for more deaths from cardiovascular disease than any other modifiable risk factor. It is second only to cigarette smoking as a preventable cause of death for any reason. This makes treatment of high blood pressure really important. From age 20-39, as long as it is normal, you should have your blood pressure checked about every 3-5 years. As you get older, the chance of high blood pressure increases, so you should get it checked once a year after you turn 40. Of course if it is elevated, you will need to have it checked more frequently. Guidelines such as these are given a lot of thought. A committee of 21 scientists and health experts with different backgrounds came together and reviewed a great deal of research (more than 900 published studies!). They have been meeting and working on these guidelines since 2014. They considered the health risks associated with different blood pressure levels as well as the risks and benefits of different treatments. 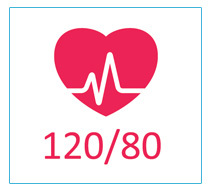 High blood pressure should be treated earlier with lifestyle changes, starting at 130/80, Stage 1, rather than the old recommendation of 140/90. Lifestyle changes alone are recommended for most adults newly classified as having Stage 1 hypertension. This includes weight loss, a heart healthy diet, sodium restriction, increased physical activity with a structured exercise program. Lifestyle changes plus medication are recommended for patients with Stage 1 hypertension if they have already had a cardiovascular event, such as a heart attack or stroke, or if they are at high risk of heart attack or stroke based on risk factors that can include diabetes, cholesterol levels, age, etc. Lifestyle changes plus medication are recommended for all patients with Stage 2 hypertension. They stress the importance of using proper technique for measuring blood pressure, as well as stressing the importance of using an average of at least 2 readings obtained on at least 2 (but can be more) separate occasions. Recommend use of home blood pressure monitoring to help with diagnosis and treatment. By using these new guidelines, we should be able to decrease the number of patients who die of heart attacks or strokes, and that sounds like a good plan to me! If you have any questions about blood pressure issues, just send a question to one of our doctors.